The summer is all about customizing player participation with uniqu e out of school time experiences that build on kids’ strengths, promote long term engagement, and expose them to new people and places. Our goal is to connect 100% of our year-round travel program participants to quality summertime opportunities – camps, clinics, conferences, outings – through our extensive and growing partner network. Further, we run other camps and clinics available to 4-18 year old Lawrence kids. 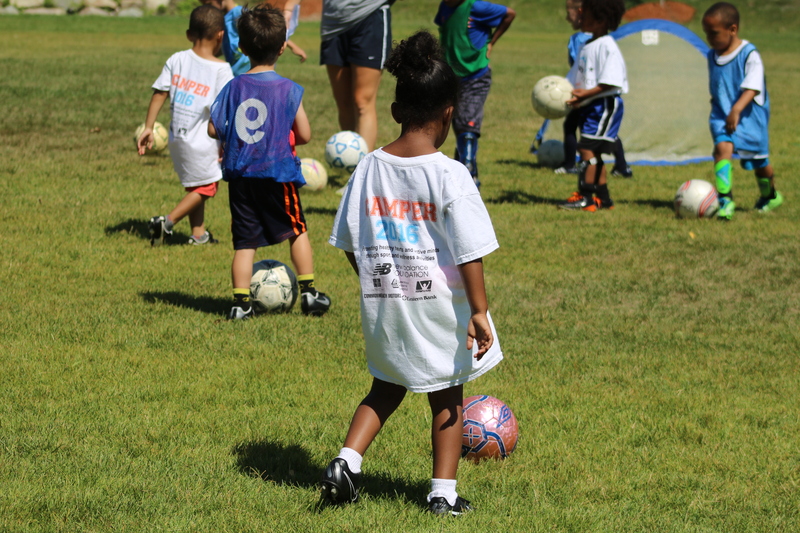 This camp, now in its 8th year, connects 115-125 elementary and middle school youth to 2 weeks of soccer play, fitness games and nutrition education. This camp is staffed by 20 coaches, including Beyond Soccer high school and college players as part of our Youth Summer Jobs Program (thank you Attorney General Healthy Summer Jobs Program!). A special thanks to long-time partners; New Balance, Essex County Community Foundation Summer Fund, Commonwealth Motors, Enterprise Bank, Everyone’s A Player and American Heart. More than 750 youth have participated since inception. See separate LSLA website for more info about this awesome, collaborative, two-week, multi-sport camp experience! We understand that transportation and family budget restrictions can make youth participation in camps difficult. Our most important 2015 initiative was the launch of summertime housing project soccer clinics with Si Se Puede. We have now brought soccer games to more than 65 girls and boys every Monday over the summer months. We expect to expand this program in 2018. 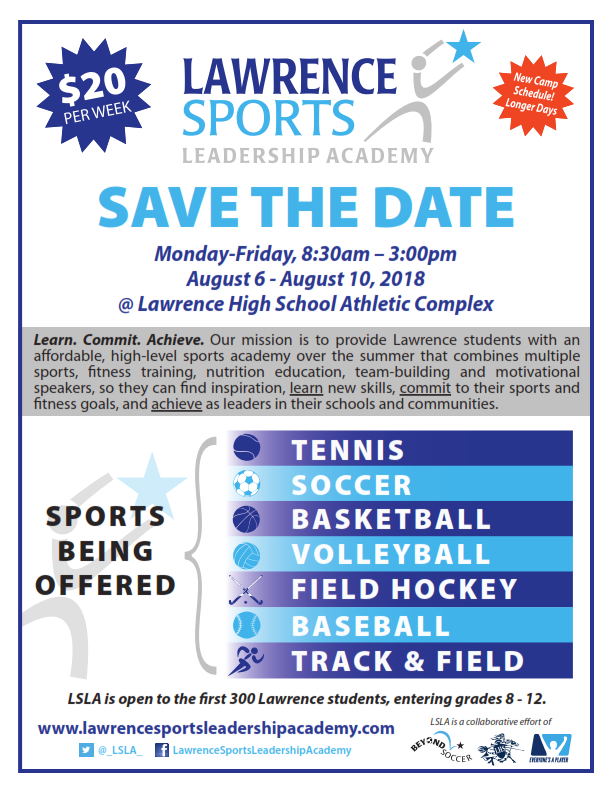 BSA hosts a camp for 35-50 Lawrence middle travel players in early July at the Greater Lawrence Technical School. What we like best about this summer experience is the enthusiasm and experience of the BSA coaches. The low coach-player ratio helps our kids develop their skills and grow their passion for the game. Off the Field Hiking Trips and Outings: We like to have fun over the summer and get kids outdoors. We go to professional sporting events, participate in local road races and explore nature with walks and hikes. Summer Referee & Coaching Courses: (see Leadership tab). Beyond Soccer sponsors referee courses in partnership with Mass Youth Soccer for high school students with a desire to earn money while staying connected to a sport they/we love. Summer Youth Employment: (see Leadership tab). We raise funds to hire full and part time summer interns to work our camps and spend time in the office. A 2015 Mass Attorney General’s Jobs grant made summer 2015 our most successful summer to date in terms of youth employment. Boston College Lady Eagles Soccer Camp: Since 2012, select travel players have attended the BC Lady Eagles Camp in Newton, MA. Coach Alison Foley loves working with our kids and is happy to assist former BC Soccer standout, Lindsey McArdle, who is Beyond Soccer’s Health Kicks! Director. 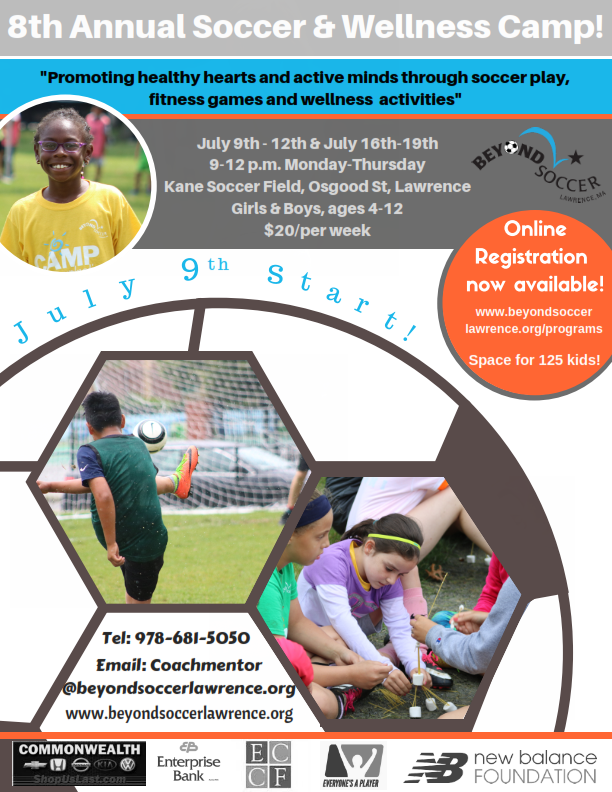 Francis Okaroh Soccer Academy: Select players on Lawrence Youth Travel teams have attended Francis’ intense, week-long, overnight soccer camp at the New Hampton School (New Hampshire). 2015 marked our 5th year partnership. Mass Youth Soccer GOALS Camp: This free program, run in partnership with Mass Youth Soccer, is available to 45 low-income Lawrence kids, ages 7-12. The GOALS Program was developed to provide rewarding athletic and life experiences to inner-city children. Nike Vogelsinger Camp @ Brooks School: This nationally renowned camp has been providing scholarship support for our kids to attend their week-long camp at Brooks School. WE are grateful for this relationship which gives our kids access to one of the best camps around.